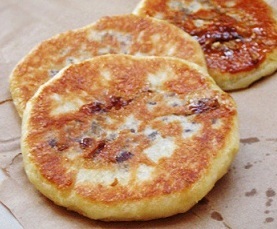 Hotteok is a sweet syrup filled pancake snacks that are very popular during the winter season and which are usually sold by street vendors in Korea. The dough for hotteok is made from wheat flour, water, milk, sugar, yeast and its handful-sized of this stiff dough is filled with a sweet mixture which may contain brown sugar, honey, chopped peanuts, and/or cinnamon. The filled dough is then placed on a greased griddle and pressed flat into a large circle with a special tool made from a stainless steel circle plate with a wooden handle as it cooks. The types of hotteok have been changing continuously throughout the years but many favor the traditional cinnamon and peanut fillings. Many variations have developed since the early 21st century where its dough may be made with green tea, corn, and other ingredients. It is generally believed that hotteok originated from Chinese merchants who immigrated to Korea after the late 19th century. However, unlike many Chinese pancakes which often contain savory meat fillings, traditional Korean hotteok is stuffed with sweet filling to suit the native Koreans’ taste buds. Readily available hotteok is commercially available to purchase in plastic packages at local Korean supermarkets.